In recent years, meditation has become a noteworthy buzzword in the global West to which reportedly amazing results can be attributed. However, there remains confusion regarding what meditation is and is not, which can make it seem beyond the scope of possibility for most of us. It often conjures up images of temple monks remaining in silence for days on end. Yet mediation does not need to be relegated only to monks and yoga masters. You do not need any special equipment, apps, or classes. 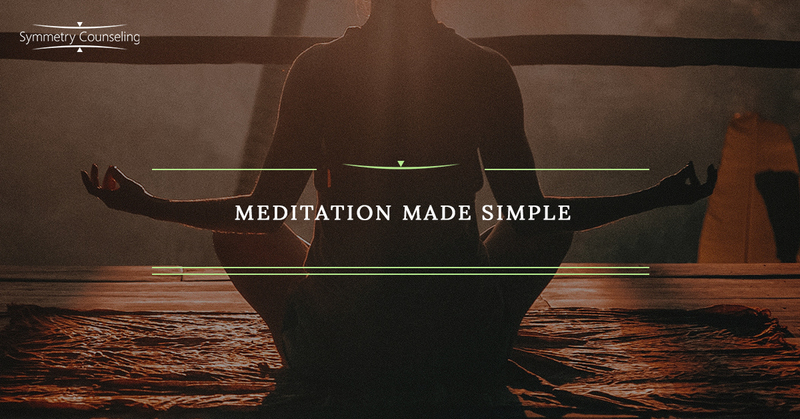 Meditation is a fundamentally simple practice which can help to provide a greater sense of calm, enhanced mind-body connection, and improved ability to be present in life. Start with breath. All meditation begins and ends with breath. It is the source of all life and energy. Begin your meditation in a quiet space either sitting or lying down in a comfortable position but not one where you likely to fall asleep if your eyes close. Imagine there is a balloon in your belly. Visualize the balloon inflating when you inhale and deflating when you exhale. This technique is known as diaphragmatic breathing and is your body’s built-in mechanism for self-soothing. Practice focusing your attention on the sensations of inhalation and exhalation. Try elongating your breaths to the count of 4 or focusing only on the physical sensations of one body part, such as your chest rising and falling. Guided meditations may also be useful if you need more structure in your practice. Bring the mind back. Perhaps the most common complaint voiced by those to whom meditation is recommended sounds something like the following. “I can’t get my mind to stop. It keeps going. I can’t focus on just one thing.” These folks are not fundamentally incapable of meditative practice, but are merely reflecting the societal confusion around meditation. The mind becomes quieter through meditation, not as a prerequisite to meditation. The brain is an information intaking and processing machine which is constantly making sense of all the stimuli we take in over a day. Even Zen masters experience their minds wandering. That’s what the mind does. While effort is made during meditation to focus attention on one thing, it is equally important to train your brain to return to the subject when it wanders. When in doubt, return to the bodily sensations of breathing. Work up to a goal. If you are new to meditation, it is important to know that it may take time to work up to practice beyond a few minutes or even a few seconds at a time. Meditation is akin to mentally lifting weights. Anyone who walks into a gym for the first time in life expecting to life hundreds of pounds is likely to be sorely disappointed and discouraged from continuing. A reasonable goal in the beginning may be to work up to 3 minutes of meditation. Begin with 1 minute of breath-based meditation daily for at least one week. Then, begin to add 15-30 seconds to your practice every few days or every week. Meditation often provides immediate benefits to mood and physical sensation, yet the most significant benefits emerge by adopting a consistent practice of checking in with the body and focusing the mind. Meditation is not beyond your capacities. You do not have to delay beginning the journey to a more whole, more balanced you. Now is the time to manifest the type of headspace you most desire. If you are still skeptical, try a meditation practice for 30 days as an experiment for yourself and notice the impact for yourself. Let our talented therapists at Symmetry Counseling help today!